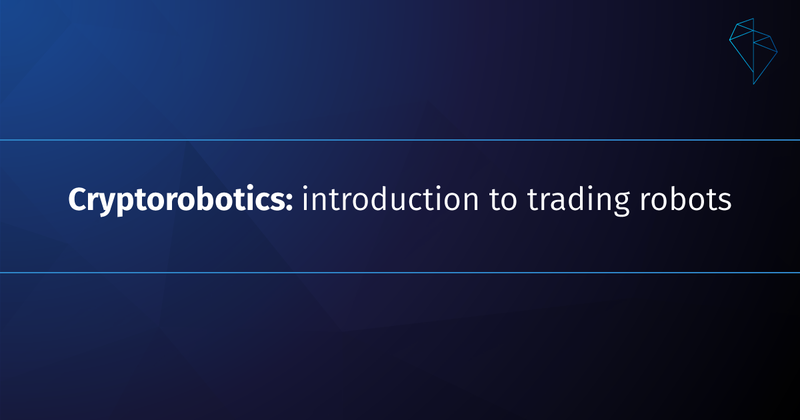 Trading robots are programs that open and close transactions according to a predetermined strategy without a trader. A robot is never tired, does not panic, does not doubt – it trades strictly according to certain conditions and is always in time to trace the slightest fluctuations of the market. Trading programs offer opportunities of algotrading on cryptocurrency exchanges. In Cryptorobotics terminal they will appear already in July 2018. Let us learn about their trading strategies. A robot trades on the basis of values of a Moving Average (MA) classical indicator. The indicator is an averaged line of price fluctuations for a certain period of time – moving average period (which is set in bars/candles). The line is calculated on each bar at its closing price (Close). Moving average is the easiest way to determine a market trend. If it is directed upward, the market grows; if downward – the quotes fall. To get a signal to enter the market, the robot uses two moving averages: a “fast” one (with a low period) and a “slow” one (with a high period). Two MA of different timeframes overlaid on the same chart will cross, since moving averages with a high period will form slower and respond to momentary market movements as slowly. That is the basis of the robot’s signals for trading operations. A fast МА crosses a slow one from bottom to top — the robot interprets this as a signal for buying and opens a “long” transaction. A fast MA crosses a slow one from top to bottom — it is a signal to sell, the robot will open a SELL transaction. an amount of a single transaction (purchase or sale amount). The essence of a strategy, according to which a High-Low robot trades, looks as follows in a generic manner: to purchase a coin at the lowest cost and to sell it at the highest cost. The user chooses a period (a quantity of bars/candles) in the past for which a robot should determine the highest and the lowest prices. When the current price approaches these values close enough, the robot opens transactions. In common logic, a BUY transaction is opened when the price is close to the minimum, while a SELL transaction – when a price is immediately adjacent to a maximum price. Regulating the robot’s settings in a different manner, the user can trade according to any strategy connected with maximums or minimums. For example, you can sell or buy both from Low and from High – depending on the coin’s behavior. Flexibility of configuration lets trade both on trend market and on flat — in the absence of a strongly expressed trend. The user determines a “corridor” of purchase/sale for a robot as a percentage of a quote staying away from maximum and minimum values. These trading robots will be accessible in Cryptorobotics terminal in July 2018 and will offer opportunities of a full-featured algotrading. Sometime later appearance of an arbitrage robot is expected; this one will play on difference of purchase and sale prices of a single tool. Each robot can be back-tested in the terminal on the history of quotes of a chosen coin free of charge. To use a robot in real trading you need to buy or rent it for ROBO-tokens – a Cryptorobotics’ internal currency. Now you can get tokens at ICO that started on May 20, 2018. Awesome Project! It`s a future of cryptotrading. Пока не нашёл у этого терминала достойных конкурентов. Обязательно регистрируйтесь на платформе #Cryptorobotics. The project is relevant at the present time. I wish good luck and financial growth to the project.